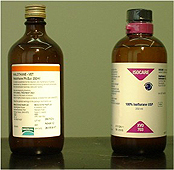 The bottle on the right contains isoflurane, and costs more than 50% more¹ than the bottle on the left which contains halothane. As well as the greater cost to purchase, animals require more isoflurane than halothane to keep them asleep. This means the cost of using isoflurane is more than double that of halothane. Here it helps to know a bit about the way the heart works. The heart is divided into four chambers. Two of these are collecting chambers for blood called the atria. The heart cycle starts with relaxed atria filling passively with blood that is returning to the heart after passing round the body or through the lungs. The atria in turn forcibly inject blood into the much larger ventricles, which a split second later contract to push blood around the body. Abnormalities of this cycle, and especially the synchronicity of the action of atria and ventricles are very dangerous to a patient, especially if the abnormality persists for more than a few seconds. One such abnormality is called atrial fibrillation. This occurs when the atria are contracting very weakly, and in effect, stop forcing blood into the ventricles. The heart tends to resist the development of atrial fibrillation when an animal is anaesthetised with isoflurane. Halothane does not have this effect. Another abnormality of heart rhythm is called ventricular premature contraction, or VPC. This involves the powerful ventricles contracting before they have filled with blood, possibly at the same time as the much weaker atria are trying to fill the ventricles. VPCs are actually quite common, but if they occur for a prolonged period can be life threatening. Halothane increases the sensitivity of the heart muscle to the affect of adrenalin, (and a number of other related hormones). During the early part of anaesthesia, animals are often under stress, and adrenalin is released, which can cause the heart to develop VPCs. Patients with pre-existing heart disease (which may not always be detected by a pre-anaesthetic check-up) are particularly at risk. Isoflurane does not sensitise the heart to adrenalin. In fact, some dogs that have an abnormal heart rhythm when conscious will actually develop a more normal one when under isoflurane anaesthesia. All animals under anaesthesia, no matter what drugs have been used to induce it, have a reduced cardiac output. This means the heart pumps less blood around the body than it normally does. Despite this, the flow of blood to the heart muscle increases during isoflurane anaesthesia. Halothane has the opposite effect; it decreases blood flow to the heart muscle. The liver is an important organ which has many jobs. One of these is removing foreign chemicals, such as drugs, from the blood. Isoflurane improves blood flow to the liver, halothane reduces it. This has important consequences for the elimination of drugs from the body. Isoflurane enters and leaves the bloodstream from the lungs more easily than halothane. This means that the depth of anaesthesia is more easily controlled with isoflurane than halothane. So, if an animal is having problems while under anaesthetic, it is more rapidly revived when using isoflurane than halothane. This has an added benefit that at the end of an operation, animals wake up faster. At Vetrica, we believe that all animals should benefit from the improved anaesthetic safety that isoflurane delivers. Vetrica only uses isoflurane as its volatile anaesthetic agent. Some cats and other small mammals, but not dogs, receive another drug called ketamine which does not have to be injected directly into a vein. This makes it particularly useful for very fractious cats which are difficult to safely restrain for an intravenous injection. Cats undergoing spay or castration procedures are also routinely anaesthetised with ketamine unless you ask us to do otherwise. (There is an additional fee for this). All other factors being equal, anaesthetic techniques utilising ketamine are probably less safe than as is described above, which is why we restrict its use to these specific conditions.